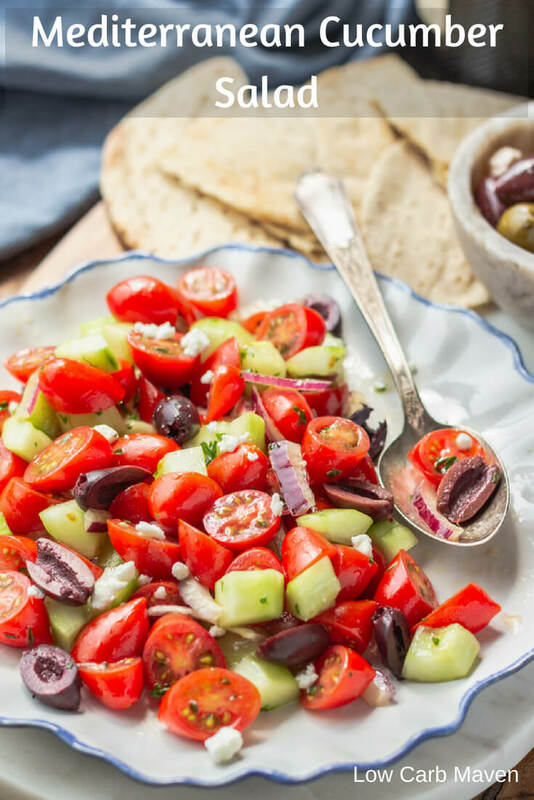 An easy Mediterranean cucumber salad featuring crunchy cucumbers, sweet tomatoes, briny olives, fresh herbs, and tangy feta cheese. Naturally low carb! I look forward to fresh summer produce every year. Yes, the magic of hot houses and refrigerated shipping affords us access to tomatoes and cucumbers year round, but they don’t taste the same. By contrast, there’s a little taste of summer in home grown vegetables from the garden. Due to the terrible California drought these past years, I don’t garden anymore. Instead, I visit the local Farmer’s Market. It’s a great way to support local families and farms and capitalize on summer’s bounty without all the work! 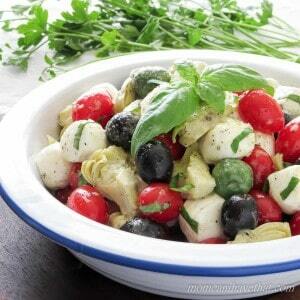 Mediterranean flavors are perfect for Summer. I love how fresh ingredients stand on their own with little to no fussing. A little olive oil, some fresh herbs and you’re good to go. 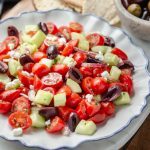 I serve some version of this Mediterranean cucumber salad every week in the summer. It’s a refreshing throw-together side that compliments any grilled meat. This recipe is easy to customize per taste and availability of ingredients. 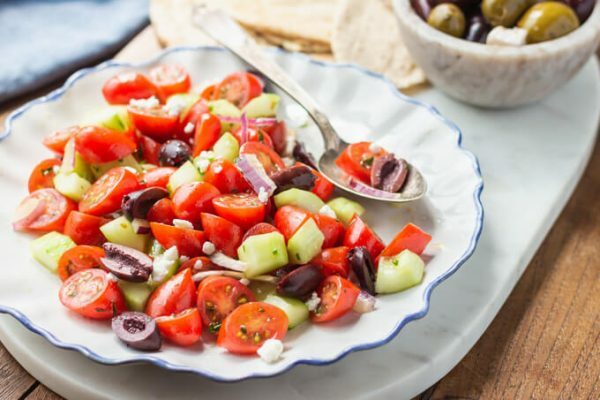 At it’s very basic, this tomato and cucumber salad is just that – tomatoes, cucumbers and a little salt and pepper. Adding extra virgin olive oil gives it a sweet-peppery-earthy flavor. A little vinegar or lemon juice brightens it up. Chopped mint, basil, oregano, or parsley lend an herby pop. 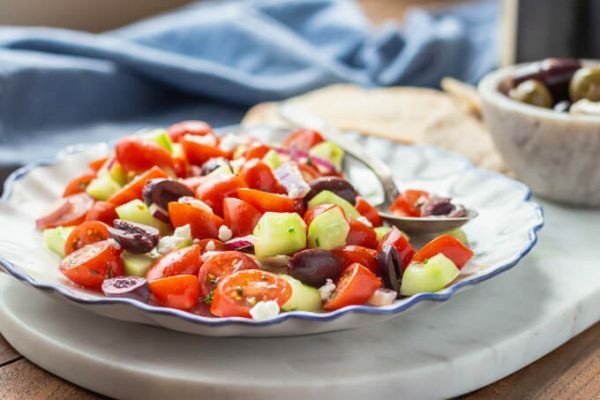 Briny Kalamata olives lend a contrast to the sweet vegetables. And, feta cheese adds a nice salty tang. This is one of those salads that hits all the taste buds – which is completely satisfying. It’s perfect served with grilled meats and fish. 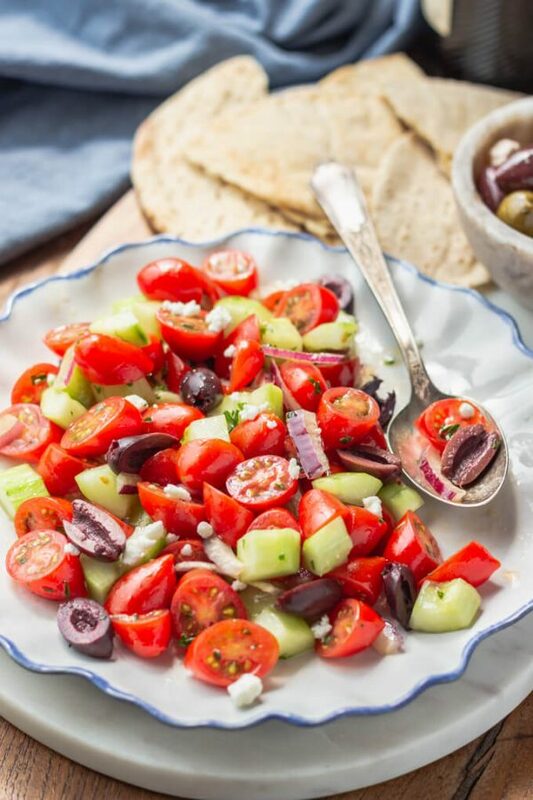 To Turn this Mediterranean cucumber salad into a meal, add flaked tuna, chicken, or salmon. Add all ingredients to a bowl except for the olive oil. Refrigerate until ready to serve. Toss with olive oil and season with salt and pepper to taste. Make it new each time by trying variations listed above. Lasts 2-3 days covered in the refrigerator. Serves 4 at 4 net carbs each. I will be putting this together tomorrow. Will need to sub for the feta. But I garden and fresh tomatoes, cukes, onion and basil. So looking forward to this and thank you, thank you, for all that you do! I just wanted to say Thank you Kim. My life has not been the same since I stumbled on your blog. I love healthy cooking but my family was not always on board with the meals I prepared which was discouraging. Well that changed about two months ago, I started preparing your recipes and voila! I get enthusiastic responses and clean plates every single time, It’s a joy; meal planning and cooking are no longer a chore, your recipes are healthy and delicious and I now look forward to meal prep and planning, cooking and eating with my family. You have made a big difference in our lives and I just want to say thank you!! !